What Are the Two Types of Weathering? What Is the Composition of a Lava Rock? What Are Five Examples of Chemical Weathering? What Are the Properties of Metamorphic Rocks? The Earth's crust is made up of rocks and minerals, primarily those of volcanic origin. Rocks are divided by geologists into types based on their mineral content and the way that they formed. Minerals are the substances from which rocks are made and are categorized based on the shape of their crystals or by characteristics like hardness, color or luster. Igneous rocks and the related pyroclastic rocks make up the majority of the Earth's crust and are volcanic in origin. These rocks are crystallized magma. Igneous rocks are subdivided into intrusive and extrusive. Intrusive igneous rocks form inside the earth's crust and have large crystals. Examples of intrusive igneous rocks include diorite, gabbro and granite. Extrusive igneous rocks form outside the crust and have small crystals. Examples of extrusive igneous rocks include andesite, basalt and rhyolite. Pyroclastic rocks — brecchia, ignimbrites and tuff — are formed as byproducts of volcanic eruptions. 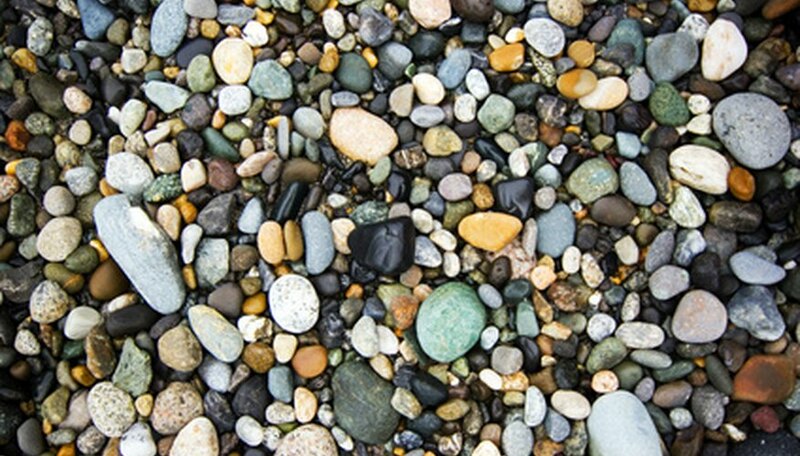 Sedimentary rocks form when small particles of rock and mineral combine into one rock. There are two primary types of sedimentary rock: clastic and chemical. Clastic sedimentary rocks, like sandstone and shale, are composed of grains of rocks and minerals that have been chemically or mechanically broken off from pre-existing rocks. Chemical sedimentary rocks, like halite, gypsum and sandstone, form when minerals or fossilized remains are precipitated as the water in which they are dissolved evaporates. Metamorphic rocks been changed by heat or pressure while deeply buried in the Earth's crust. These rocks begin as igneous or sedimentary rocks, but due to exposure to high temperatures or to compression by other sediments or by continental collision, they undergo significant change by becoming harder, by combining with other minerals in layers or by recrystallizing. Gneiss, marble, schist and slate are common metamorphic rocks. Minerals are divided into seven types, based on the type of crystal that they form. Carbonates have a central carbon atom covalently bonded to three oxygen atoms and ionically bonded to one or more positive ions. Halides combine a halogen atom with atoms of a more electropositive element. Oxides are composed of negative oxygen ions bonded to one or more positive metallic ions. Silicates are compounds of silicon and oxygen with other elements or minerals. Sulfates comprise positive sulfur ions bonded to negative oxygen ions, while sulfides comprise negative sulfur ions bonded to positive metallic ions. In addition to being classified by their crystalline structure, minerals can be classified based on their physical characteristics. Color may be idiochromatic — always displaying the same color based on a component element's light reflective properties — or allochromatic — displaying various colors due to the presence of an element that is not naturally part of the crystal structure. Streak is the color of the mineral when it is pulverized. Luster is the quality of light transfer — where the mineral falls on a continuum between opaque and transparent. Density is the mass of the object in relation to its unit volume; darker minerals are generally denser than light ones. Hardness, measured by the Mohs' scale, means how difficult it is to scratch a smooth area of the mineral. Cleavage is the plane upon which the mineral naturally splits due to structural weakness, while fracture refers to the way it breaks when crushed. Tenacity refers to the ability of the mineral to hold its shape when put under pressure — its flexibility. Habit references the distinctive form that the crystal structure takes. Wendy Anderson has been writing professionally since 2006, and has had poems, short stories and essays published in several local literary magazines. She has also been copy-editing for more than 15 years, and has worked with local and national authors and publishing houses. She holds a Bachelor of Arts in English from Lambuth College. Anderson, Wendy. "Rock & Mineral Types." Sciencing, https://sciencing.com/rock-mineral-types-7662764.html. 24 April 2017. What Are the Three General Types of Rocks?